Cake decorating recipes can include frostings which contain a high ratio of fat to water; icings which have a high ratio of water to fat; and toppings which constitute any non-liquid ingredient that tops a dessert. Vegan Orange Icing is perfect for doughnuts, cookies or cakes such as Rosemary Olive Oil Semolina Cake. It features fresh orange juice that lends a bright burst of flavor, coconut oil to allow it to solidify properly and a touch of vanilla extract for depth of flavor. This Rich Vegan Coconut Frosting recipe is just bursting at the seams with coconut flavor. It's similar in flavor and texture to the frosting at BabyCakes bakery if you've ever been lucky enough to do a "shot" of theirs. This vegan frosting differs in that it takes advantage of caramelizing sugar to the thread stage of 230F (110C) where it contributes a smooth velvety texture. It also uses soy milk powder (not to be confused with soy flour) to improve creaminess and a dash of vanilla extract to tie it all together. A touch of agave syrup inhibits sugar recrystalization in the frosting. There is a delicate balance due to coconut oil's tendency to melt above 76F (24C) which is one of the caveats of using coconut oil in a frosting. Be extremely careful if you choose to customize this recipe with your own flavor substitutions; adding too much liquid can make it excessively runny. You even have the option of using refined coconut oil if you want to go in a completely custom non-coconut flavor direction. When using this frosting and other coconut oil based frostings, try to keep your cake in temperatures below coconut oil's melting point or your frosting may slip slide away along with your sanity. This Vegan Vanilla Icing recipe is a great companion for drizzling on Vegan Cinnamon Rolls, danishes, or Vegan Pop Tarts. It features confectioners sugar as its base and just a touch of non-dairy milk and vanilla extract to bring it all together. 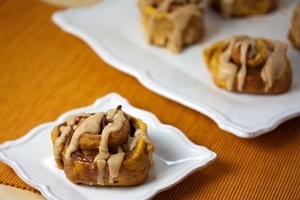 This Vegan Rum Spice Icing recipe is a great companion for drizzling on spiced versions of Pumpkin Cinnamon Rolls, danishes, or Pop Tarts. The vegan icing features powdered sugar for its base, dark rum, cinnamon, cardamom and cloves to move the spice factor forward. Feel free to cut back on the rum or eliminate it completely if you're concerned about alcohol consumption. This creamy Rich Vegan White Chocolate Frosting is a more intensely flavored recipe alternative to other vegan white frostings. It's great for cakes where you may be concerned that a dark chocolate frosting could be too much chocolate (if that's even possible). It takes advantage of caramelizing sugar to the thread stage of 230F (110C) where it contributes a smooth velvety texture. It also utilizes cocoa butter as the main fat with soy milk powder (not to be confused with soy flour) to help with emulsifying and enhancing creaminess. Cocoa butter can be difficult to work with because when it reaches it's melting temperature range of between 93F (34C) and 100F (38C) it melts instantly. Whisking the frosting periodically as it gradually cools back to room temperature in the refrigerator solves this issue. 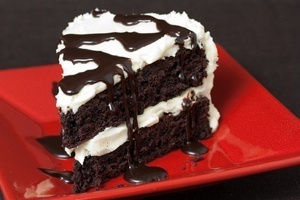 The stiffness of this frosting can be adjusted by adding or subtracting 1 Tablespoon of water. This smooth Vegan White Chocolate Ganache recipe uses cocoa butter without the cocoa solids making it a versatile white and creamy vegan topping for cakes, truffles or fillings. Unlike margarine or butter, cocoa butter and coconut oils melt rapidly when they reach their melting point instead of softening slowly. Due to this, extra care must be taken as it resolidifies from it's melting temperature of 93F (34C) to 100F (38C). You can adjust the firmness by adding or subtracting 1 Tablespoon of water. Also feel free to substitute 1 teaspoon to 1 Tablespoon of liqueur or other flavoring extract to further customize your ganache. 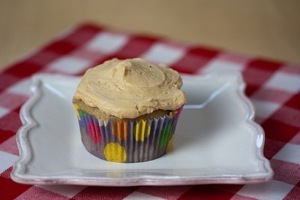 This silky smooth Rich Vegan Peanut Butter Frosting recipe packs a peanut buttery punch that can really dress up any vegan cake. This recipe takes advantage of caramelizing sugar to the thread stage of 230F (110C) where it contributes a smooth velvety texture. It also utilizes the power of soy milk powder (not to be confused with soy flour). 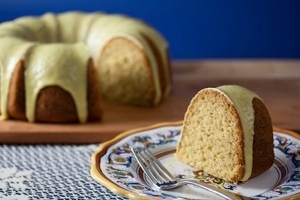 Soy milk powder adds extraordinary creaminess while still allowing the frosting to remain firm. Use this smooth, creamy Rich Vegan Buttercream Frosting recipe for decadent vegan cakes where you want some buttery flavor to shine through. In my search for a truly decadent frosting that is also resistant to melting in warmer temperatures, I utilized the power of soy milk powder. (not to be confused with soy flour). 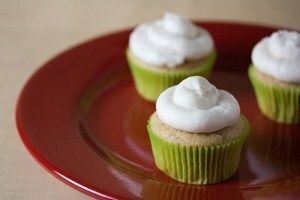 Soy milk powder adds extraordinary creaminess while still allowing the frosting to remain firm. This allowed me to use a simple syrup (sugar and water) for a sweetener so the frosting is silky smooth. This vegan frosting also takes advantage of caramelizing sugar to the thread stage of 230F (110C) where it contributes a smooth velvety texture. Finally, I used Vegan Butter or margarine as the main fat due to it's affordability and availability. 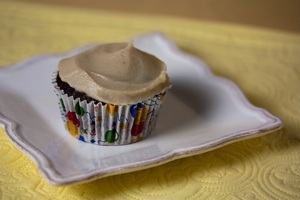 This silky smooth Rich Vegan Maple Frosting recipe uses slightly caramelized maple and agave syrup as its base. This allows it to be 100% sweetened by these syrups, giving it maximum maple flavor and a velvety consistency with no sugar crystals. The agave syrup prevents the maple syrup from crystalizing after it's caramelized. The firmness of this frosting can be customized to your preference easily by caramelizing your syrups plus or minus 5F (3C) from the 235F (113C) caramelization temperature which is known as the thread stage. If you slather this on pancakes I promise not to tell anyone. 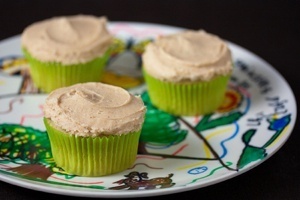 Real banana is blended into this Rich Vegan Banana Cream Frosting recipe which creates a rich banana cream with butterscotch overtones. This vegan frosting recipe utilizes the power of soy milk powder (not to be confused with soy flour) which adds extraordinary creaminess while still allowing the frosting to remain firm. It also takes advantage of caramelizing sugar to the thread stage of 230F (110C) where it contributes a smooth velvety texture. 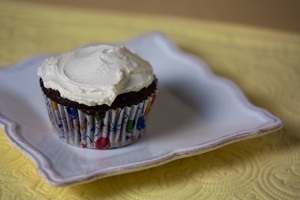 The firmness of this frosting can be customized to your preference easily by adding or subtracting 1 Tablespoon of water. 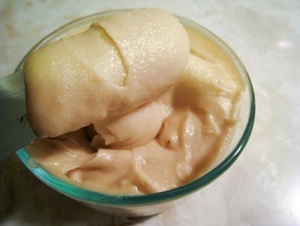 In search for a truly decadent vegan Rich Vegan Vanilla Frosting recipe that is also resistant to melting in warmer temperatures, I utilized the power of soy milk powder (not to be confused with soy flour). 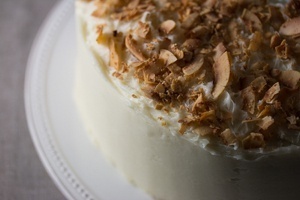 Soy milk powder adds extraordinary creaminess while still allowing the frosting to remain firm. This frosting also takes advantage of caramelizing sugar to the thread stage of 230F (110C) where it contributes a smooth velvety texture. Finally, I used vegetable shortening as the main fat due to it's affordability and availability. 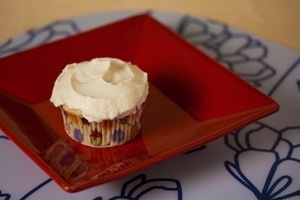 The firmness of this frosting can be customized to your preference easily by adding or subtracting 1 Tablespoon of water. This recipe also works well as a reference frosting recipe that can be customized into an endless variety flavors by swapping out water-based ingredients for the water and/or adding extracts to suit your style. Although not as smooth and creamy as Dark Velvet Ganache, this Easy Vegan Ganache recipe is still great when you need vegan ganache in a pinch. 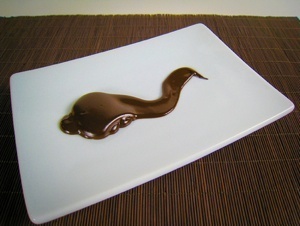 Ganache can be a very versatile base for a recipe. It can be adapted to anything from frostings to truffles to fillings. Just adjust the non-dairy milk in this recipe plus or minus up to 2 Tablespoons to get the thickness that suits your needs. For example: 2 more Tablespoons non-dairy milk will make this ganache solidify into a soft frosting-like consistency at room temperature. ½ cup of non-dairy milk yields ganache that is perfect for vegan cakes. You can even customize it further with things like Grand Marnier, Chambord, espresso or mint extract. 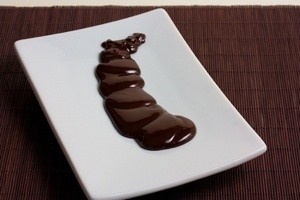 Ganache can be a very versatile base for a recipe. It can be adapted to anything from frostings to truffles to fillings. Just adjust the Soy or Cashew Cream in this Vegan Dark Velvet Ganache recipe plus or minus up to 2 Tablespoons to get the thickness that suits your needs. For example: 2 more Tablespoons Soy Cream, Cashew Cream or non-dairy milk will make this ganache solidify into a soft frosting-like consistency at room temperature. 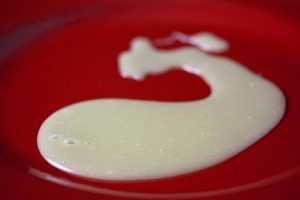 1 cup of Soy or Cashew Cream yields ganache that is perfect for cakes. You can even customize it further with things like Grand Marnier, Chambord, espresso or mint extract. This Creamy Vegan Cashew Cream Cheese Frosting recipe is a great way to get that cream cheese flavor without resorting to lab derived ingredients like xenophobo-lactate. This vegan frosting features cashews and is enhanced with just the right amount of apple cider vinegar, lemon juice, sugar and vanilla extract. The mixture is then given a rest to allow complex flavors to develop more fully. It takes longer to make due to this step but it's worth it.